...for growing cat grass indoors! James and Fiona may have differing dispositions and diverging views on many key issues, but they have the exact same thoughts about cat grass. "Nom nom nom! It's mine, all mine, grown only for me!" I've seen cat grass both as live plants and as seeds at various shops and online. I grow mine from oat and wheat seeds I get from an animal feed store. They're used to selling huge quantities, so the pound I buy of each seed type ends up costing pennies or often just being given to me. I started buying it this way when I was tending the cat garden and I needed lots of seeds. If you'll be taking part in my seed swap, I'll be adding multiple packets with these seeds to the swap! The seeds need very little light to germinate and are up in only a few days. You have to keep the grass cut back or the blades get too tall and bristly over time. As winter drags on, the grass does get ratty (especially as Fiona sits in the container), so I just reseed afresh. Cute kitties! They really like having a "piece" of the outdoors. We have two cats that are indoor outdoor kitties. They would both have a fit to no end if we did not let them outside. Both were strays that came to us. How cute! Looks like a good advertisement for cat grass. Your kitties are so cute. They are quite the pampered pets. I love seeing the first one noshing on the grass and then the last one sitting in the grass. It is obviously most appreciated. I love how you brought the outdoors, indoors for your cats. So cute! I've never grown cat grass before. I do hope there are still some seed packets left when the seed swap gets to me! I might have to keep Sophie out of it, though:) Toby and Tarzan say "hi" to James and Fiona, but Toby hopes that Fiona never visits and sits on HIS grass! 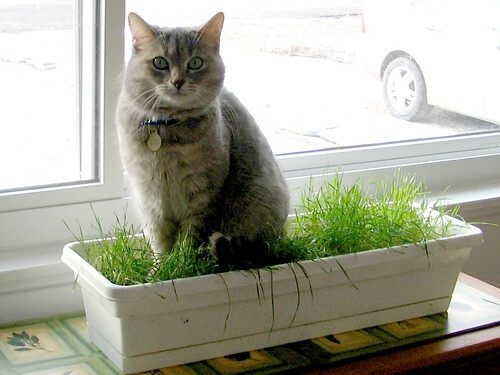 I might need to get a cat, just to grow cat grass! Only have a dog at the moment.....not sure that the puggle would fully appreciate the delicious treat! 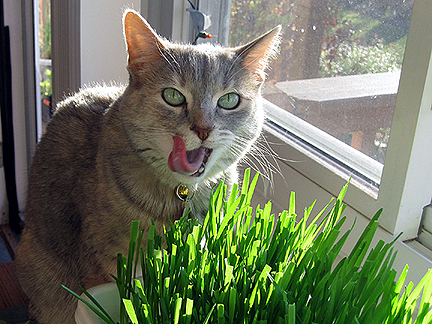 Monica, It looks like your cats love their grass! :-) Perhaps you'll need a larger box so they can both be in it at the same time?? Count me in for the seed swap. I really liked it this past year. 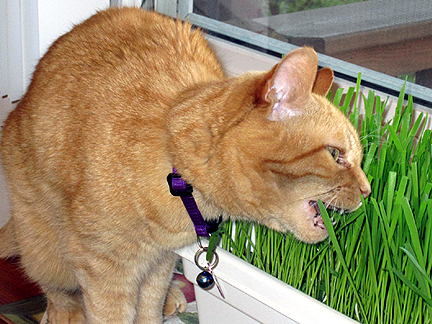 Kathleen just posted on her cat grass. I thought I was at the same blog. Small world for sure. These pictures are great! Fiona, you look extra cute in the grass pot! Obviously, very tasty ... cute photos! How cute. I have never had cats, but I have a friend who has six. Liebe Monica, unsere drei fressen alle kein Katzengras, nur draußen die Gräser. Ich finde James und Fiona bei unheimlich süß. So niedliche Samtpfötchen. Einfach zum Liebhaben. I'll have to plant some indoor grass as Ceefer hasn't been out much these past few days due to a combination of Bonfire Night (fireworks+++!) and endless rain! Monica - der 23. Dezember gehört dir! Ich freue mich auf deinen Beitrag. That last shot of Fiona really cracked me up Monica. She clearly loves her grass. I've thought about growing this just for the greenery. Looks like a nice indoor version of a lawn. Ich habe noch nie Katzengras im Haus ausgesät. Jeanie und Garfield gehen bei jedem Wetter in den Garten und irgendwo finden sie auch immer noch Gräser zum fressen. Aber wenn man keinen Garten hat, ist das sicher ganzjährig eine gute Sache. I've just recently been growing wheat for my cats. I never knew how much they'd like it! Mine don't last as long as yours (all winter??). I do cut it back though. Sweet looking cats you have there.